Nueva Ribera Beach Club can be found on the shores of the Mar Menor in Los Alcazares. The desire to create a Private Beach Club offering breathtaking scenery, lush greenery and an area of relaxation has been fulfilled by the design and location of the Nueva Ribera Beach Club. The Beach Club offers its residents access to a private restaurant, out-door cafes, jetty, health and fitness club and of course beauty centre. Access to the Beach club is restricted to residents only by the supervised access and private, underground garage facilities. 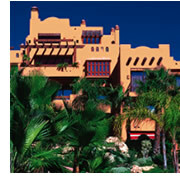 The properties on the resort consist of apartments, bungalows, terraced houses and detached villas. All designed to the highest standard by prestigious architects, Hugo Torrico and Jamie Hernandez. The under-ground garages, numerous swimming pools, landscaped gardens, private beach and fitness centre make this resort one of the most desirable locations on the Mar Menor. Furnished to the highest standard. Shared Ownership schemes from Sunset Estates are genuine investment opportunities, complete with deeds, at affordable prices that can appreciate in value and be sold on just like any other property.